Open the curtains and look outside. 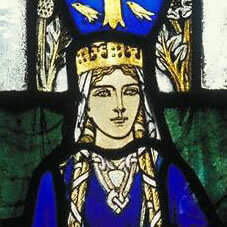 It is the 11th century and you are Queen Margaret of Scotland. You have just woken up in the royal chamber at Edinburgh Castle. It is just after daybreak. First things first, you must say your morning prayers. The court of your new husband, Malcolm III 'Canmore'. It is the year 1070. Choose wisely, for who knows what is on the cards for you?